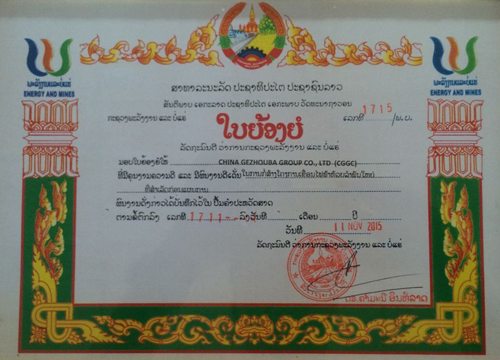 CGGC won the Special Contribution Award from Laos State Power Corporation. 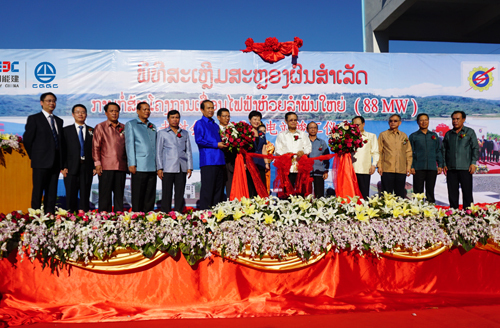 On 14 November, 2015, Laos State Power Corporation held a solemn completion-ceremony at Houay Lamphan Gnai Hydropower Station in Laos. CGGC won the Special Contribution Award from Laos State Power Corporation by virtue of its first-class constructing performance and strong contracting capacity. The ceremony was attended by Somsavat Lengsavad, Vice Premier of Laos, Zhao Wenyu, Economic and Commercial Counselor of the Embassy of China in Laos, Canmani Intela, Minister of Energy and Mineral Ministry of Laos, four provincial leaders from the south of Laos, directors of Laos State Power Corporation, related directors of CGGC NO. 2 Company and CGGC International Lao Branch. CGGC NO. 2 Company, on behalf of the EPC Contractor, expressed their sincere appreciation to Vice Premier of Laos, Energy and Mineral Ministry and social communities that have been caring about, supporting and helping CGGC for a long time. CGGC has been in contract to build Houay Lamphan Gnai Hydropower Station, Rural Electrified Project in the North, Xesalalong Irrigation Project, Rural Electrified Project in the South and Nanjian Hydropower Station and other projects in recent years in Laos which is one of the most important overseas markets of CGGC. Sticking to the cooperative philosophy of "fairness, honest and win-win", CGGC keeps good partnership with all sectors in Laos and greatly, boosts the sustainable development of Lao economy and builds up good international image of Chinese enterprises in Laos. Canmani Intela, Minister of Energy and Mineral in Laos, and Khamphoui Betawang, Governor of Sekong, highly praised CGGC for its performance on the Houay Lamphan Gnai Hydropower Station. They said that the Station upon its completion was so meaningful to Lao’s progress towards industrialization and modernization. This project has made great contribution to the social and economic development of Laos. At the ceremony, Canmani Intela issued the trophy and honorary credential of Special Contribution Award from Laos State Power Corporation to CGGC; Sisavath Thiravong, manager of Laos State Power Corporation, issued the Hand-over Certificate and individual honorary credentials of the Station to CGGC Project Management Department of Houay Lamphan Gnai Hydropower Stations. Under common witness, Somsavat Lengsavad, Vice Premier of Laos, cut the ribbon in person for the completion of Houay Lamphan Gnai Hydropower Station in Laos, rang the lucky bell that symbolized good luck and flied colored balloons. The completion ceremony ended in complete success. 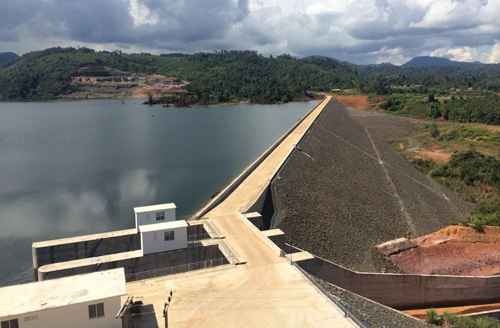 Houay Lamphan Gnai Hydropower Station is the first project on EPC basis executed by CGGC in Laos. With installation capacity of 88MW, highest water level of 820 mm, largest storage capacity of 141 million m3 and maxi height of the rockfill dam with clay core wall of 75.6m, it is the largest hydropower station in south Laos. As the first international EPC project of CGGC No. 2 Company, Project Department sticked to the management concept of "One Country, One Policy; One Point, One Policy" under the management guidance of “prioritized design, advanced plan, professionalized construction and labor localization”, worked hard and bravely faced difficulties, and thus had successfully solved many technical problems including scheme change of 560 m pothole, relocation of quarry due to geological changes and optimization of open conduit. The Department had also overcome many obstacles including construction in primitive rain forest, language differences, customs clearance of device and resource organizations. It is handed over after commissioning on 3 September 2015, 66 days ahead of the contract deadline, which built a good corporate image in Laos.